I had my first Croque Monsieur when I lived in France during culinary school. To this day it has remained my favorite sandwich. 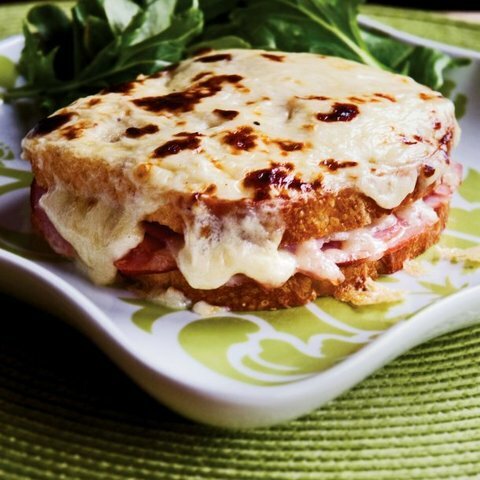 Basically, a Croque Monsieur is a grilled ham and cheese sandwich. But the French have elevated what would be a simple sandwich into a work of art! A classic ham and cheese is slathered with a béchamel sauce to make it even more indulgent. The key to a good Croque Monsieur is the ingredients. Since the ingredients are few, you need to use good ones. Traditionally, a nutty Gruyère or Swiss Emmental cheese is used. Most markets carry these cheeses, but in a pinch, a good Swiss cheese could be substituted. As for the ham, this sandwich is a wonderful way to use up the leftovers from your Christmas baked ham. The béchamel sauce is what makes this sandwich. Considered a “mother” sauce in French cuisine, a béchamel is very simple to prepare. Butter and flour are cooked together over low heat before milk and cheese are added to make this traditional cheese sauce. Thanks to the cheesy goodness that the sauce adds, it really is a knife-and-fork kind of sandwich. This classic French treat is perfect for supper, lunch or a weekend brunch. They are so rich, serve them simply with a salad or soup. However you choose to serve them, I bet they will become your family’s favorite ham-and-cheese sandwich too. In a small saucepan over low heat, melt the butter. When the butter starts to foam, add the flour. Cook, whisking until thickened, about 1 minute. While continuing to whisk, gradually add the milk. Cook, whisking constantly, until the sauce is thickened, about 2 to 4 minutes. Remove the mixture from the heat and add the nutmeg, Parmesan, and 1/4 cup of the Gruyere. Season with salt and pepper to taste. Set aside. To assemble the sandwiches, place 4 slices of the toasted bread on a baking sheet. Lightly brush each of the slices with 1 tablespoon of mustard. Top each with 1/4 of the ham and 1/8 of the remaining Gruyere (about 1/4 cup). Top each with one of the remaining toasted bread slices. Pour the cheese sauce evenly over the tops of the sandwiches and sprinkle each with 1/4 of the remaining Gruyere. Transfer to the oven and bake until warmed through, about 5 minutes. Turn on the broiler and broil until the topping is bubbly and lightly browned about 3 to 5 minutes. Serve hot. Variation: Feeling indulgent? Top your Croque Monsieur with a fried egg and you will be enjoying a treat the French call a Croque Madame. From Simply Suppers by Jennifer Chandler.